The onion soup mix gives this recipe the extra spice that it needs! I’m not going to add this to the recipe, but cutting up fresh onions is also a good addition if your family likes onions. My 5 year old hates them so I try to leave the obvious pieces out when possible. Put contents in slow cooker. Cook on low for 8 hours. If you cook it on high, your meat will be done, but not quite as tender if you only cook it for 4 hours. Pour into freezer safe bag with roast that was removed from it’s packaging. Peel and slice carrots and freeze in a separate bag. Remember to pull contents out the night before and let it begin thawing in the refrigerator. If you happen to forget, just throw it all in the crock frozen, but you’ll want to give it about an hour of extra cooking time. On cooking day, peel potatoes that you need for your family size. Put roast in the water/soup mixture on the bottom and then stack the potatoes and carrots on top of that. I prefer the meat to be in the juices so that it continues to get the flavor of the onion soup mix, but if you would rather have your veggies get that taste in them, put the vegetables on the bottom and the meat on top. Tip: If you’re really short on time, just put the washed potatoes in with their peel. 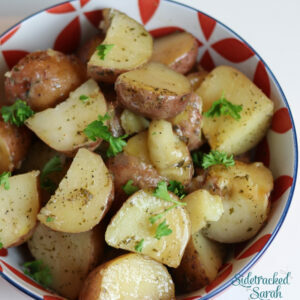 This recipe is part of Week 3 of the Crockpot Freezer Meals. If you’ve missed them, you should check out Week One and Week Two. If the Crockpot Freezer Meals have been helpful to you, I’d love it if you’d take a minute to like Sidetracked Sarah on Facebook. Also, for a Free 1 Week Printable Crockpot Freezer Meals Menu, be sure to subscribe to my email updates. Your free menu will be emailed as soon as you confirm your subscription. Skillet Shrimp and Pasta Primavera Recipe - 20 Minute Meal!